When two children are fighting on the same piece of chocolate, how would a mother play a mediating role between them? 4 Recession – A Jolt for Anil Ambani’s Fortunes? When it came to feuding Ambani brothers, Kokilaben had no other option but to move forward with the latter case scenario of dividing equally the fortunes of the humungous empire of the Reliance Group which was built under the leadership of late Dhirubhai Ambani. In June 2005, Mukesh and Anil Ambani signed a MoU to reorganize Reliance Industries, in order to take over reins of different assets and businesses of the group under their individual domain. The most significant aspect of the MoU was that RIL promised to supply 28 million cubic meters of gas for 17 years at $2.34 mmBtu to Anil Ambani’s RNRL. However, the MoU came under dispute subsequently in 2007 on government setting up a price of $4.20 mmBtu for gas contracts in the KG Basin fields. The core business of the group in the form of energy and petrochemical business was pocketed by Mukesh Ambani, while the junior Ambani inherited Energy, Financial services in form NBFC business and a newly developed but fast emerging Telecom business of the Reliance Group. At this point in time, during the process of de-merger, the fortunes of the group were distributed equally between the two estranged brothers. Anil who had finance-related acumen was more than content while inheriting business of Reliance Capital, apart from group subsidiaries such as Reliance Infrastructure (Power business), Reliance Communications (Telecom business) and not to mention RNRL – somewhat a shell company with interests in marketing of natural gas. On the other hand, Senior Ambani was happy with the group’s core business of Petrochemicals where Mukesh excelled in terms of technical know-how and interests. However, as time passed, both the brothers made efforts to expand and diversify their businesses post de-merger. Anil Ambani had dreams to construct a mega Rs.28000 crore power project at Dadri powered by a cleaner fuel in form of gas, in contrast to coal fuelled projects under the portfolio of Reliance Power. On the other hand, Anil also diversified with mega-infrastructure projects including metro rail projects under the portfolio of Reliance Infrastructure. The Junior Ambani also became active in the space of Media and Entertainment by acquiring Ad-labs Films Ltd. However, Senior Ambani moved along the lines of his traditional strength of Petrochemicals business. He came up with a new company in the form of Reliance Petroleum (RPL) and created the world’s most envied Petroleum Refinery in Jamnagar. Later, this company was merged with the parent company Reliance Industries. Mukesh also came up with subsidiary involved in new-age concept of Retailing under Reliance Retail, Reliance Trends, Reliance Jems & Jewels and Reliance Digital. At the time of de-merger, both the brothers departed amicably with equal distribution of the Group’s fortunes between the estranged brothers. From here, it remained on both the brothers as to how they expand their individual empires along with the crucial support of their shareholders and other stake holders. 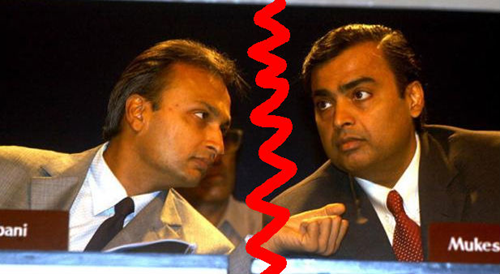 Even as both the brothers started off as equals, their groups under the leadership of individual Ambani brothers have moved forward in their respective line of businesses but in different directions of claiming fortunes. Recession – A Jolt for Anil Ambani’s Fortunes? Mukesh has been growing in strength by every passing year, while Anil Ambani has lagged quite a bit over the last 5 years. Mukesh’s wealth has surged to roughly around $29 billion even as Anil’s fortunes are stuck at $14 billion, a whooping half that of his senior brother’s standing. In fact, before the global recession was witnessed a couple of years back, the difference in fortunes of the feuding brothers stood around $10 billion. Since then, the market capitalization of Anil Ambani’s Reliance Capital and Reliance Communications has taken a severe beating, even after the current sharp recovery in the Indian benchmark indices. This has widened the gap in the fortunes of both the brothers from $10 billion during pre-recessionary period to $15 billion post-recovery. The business under Reliance Communications which was seen as fast emerging telecom business before the de-merger – fared poorly over the last couple of years speaking in line with relative performance in terms of market capitalization of the company on the Indian bourses. The telecom industry remains completely bogged down by the intense price wars and over-crowded capacity of the sector. The company was also alleged by DoT for misallocation of revenues in its accounting practices. The stock price of the company is way below the peaks levels of around Rs.800 witnessed during the peak of the previous Bull Run, currently at depressed Rs.150 levels. The business under Reliance Capital has somewhat been the star performer for the Anil Ambani’s group. The company’s insurance business has been one of the fastest growing companies under private insurance space. The premium from the insurance business has surged more than five times over the last 3 years. On the other hand, Reliance MF is still a leader with nearly Rs.1 lakh crore in assets under management. Reliance Growth scheme of the group still remains one of the most admired mid-cap funds among the retail investors. More recently, RBI has allowed entry of new players for granting of banking licenses to private sector entities and NBFCs to enter into the commercial banking space. Reliance Capital could be one of the key beneficiaries of this new announcement as it intends to tap pan-India banking business. However, the stock price of Reliance Capital has remained depressingly low around Rs.700, as against the peak level of around Rs.2500 witnessed during the previous bull phase. This depressing market capitalization levels has exerted pressure on the valuation of the company from pre-crisis levels. At the peak of the previous bull run, Reliance Infrastructure (REL) had come out with the IPO of its power related subsidiary Reliance Power, which saw a huge rush of retail investors to grab on the future power story of the Reliance group. However, what followed later is no secret to anybody reading this article. The crash in the stock price of Reliance Power has halved the valuation and market capitalization levels of both Reliance Power and REL, in the process disappointing investors with unprecedented losses in IPO of Reliance Power. After transferring the power related business into its subsidiary Reliance Power, REL shifted its attention and involvement into major infrastructure projects including mega metro rail projects. The market capitalization of REL is way off from its peak levels of around Rs. 2200 witnessed during the frenzy of Reliance Power IPO. I’ve taken the analysis of both these companies together as their fortunes are somewhat linked with each other. Reliance Power has plans to built 35000 mega watt of green-field power generation projects. Anil Ambani has planned the biggest power project of all at Dadri, with expectation of supply of gas through RNRL, originally sourced from RIL, at $2.34 mmBtu as per the MoU signed in 2005. However, in its recent verdict the apex court has directed that the private MoU signed between the feuding Ambani brothers cannot be upheld against the PSC agreement signed with the government, the owner of the gas. This verdict has come as a big jolt to the junior Ambani camp whose costs for their ambitious power project could escalate dramatically to $4.20 mmBtu as per the price fixed by the EGoM. Specifically speaking about RNRL, if the case would have been gone their way, it could have translated into a profit of Rs.3000 crore a year for this gas company. However, the negative verdict renders this company into a near shell company with some coal based methane blocks under its portfolio. To conclude, post de-merger and to some extent even recently witnessed global crisis, the valuations of all the ADAG group companies have been a laggard in terms of market valuations and even performance wise. On the other hand, the performance of Mukesh’s RIL has remained stable and sound all this while except that the company’s Gross Refining Margins (GRM) took a small hit on account of recessionary impact of fall in demand of crude oil. However, the demand and GRM are likely to scale higher gradually, as optimism returns in the global markets. Will Anil Ambani’s ADAG Group of companies recover any time soon? "Reliance & Ambani Brothers – Past, Present & Future…", 5 out of 5 based on 1 ratings. Ambani brothers …This is one of the best write ups I have read of late. It is concise and epitomises the long drawn battle…. it ia win win situation. but share market is yet to endorse ! Thanks Ramarao M.S. for the appreciation. I would like to make a small comment on the article. When Mr. Viral says “At the time of de-merger, both the brothers departed amicably with equal distribution of the Group’s fortunes between the estranged brothers.” I beg to difer. The above statement is not correct unless one includes the gas supply agreement at a cheaper rate. As Mukhesh got a bigger share of Reliance wealth than Anil, with the assumption that by supplying gas (of certain qyantity, at a certain cheaper rate, and for certain no. of years) the imbalance will be corrected. Once each brother took over his company, immediately Mukhesh disagreed to supply gas stating many reasons (I am not arguing whether the reasons are right or wrong). The MOU is the basis of the wealth division. Then if gas can not be supplied at cheaper rates, the wealth division is not done properly. Mr. Viral is right abt Relcap. Actually I was wondering why Rel Cap has to go down? Its business fundamentals are still strong. I totally agree with your views on inequality aspect creeping-in after recent verdict of apex court that PSC reigns over private MoU. But, the post is written with respect to OVER-ALL under-performance of various ADAG Group’s market capitalization levels for businesses of Reliance Communication, Reliance Infrastructure (the stock is down 50% after R.Power IPO) and Reliance Capital, and not just RNRL or Reliance Power which are severely hit by recent verdict. Suppose RNRL would have won the RIL-RNRL gas pricing dispute case, even than the over-all ADAG group would have been laggard to Mukesh-controlled companies. I totally disagree with the gas supply agreement at a cheaper rate between the Ambani brothers. It is like If two brothers are de-merging their fathers wealth – it includes that the National Property like TajMahal belongs to Elder brother and the Charminar In hyderabad will be under the name of Younger brother…! what kind of rule or Law is this…one ! Will any one agree….If there is an agreement like this and the Property Tajmahal and Charminar will belong to the Two brothers..hereafter….! FTW. Its the same Case in the KG basin, Natural Gas, its the National Property (a Lot more Valuable than Tajmahal/Charminar), It will controlled by the Government, Reliance is to work to get the Gas out from the Ground, and it will be paid by the Govnt, for its efforts. And the Price on the Gas will be given by the Govnerment to all the Customers of Reliance (irrespective of agreements). In-order to be Wise on the piont :- depart amicably with equal distribution of the Group’s fortunes between the estranged brothers, IF THATS THE REAL POINT TO BE CONSIDERED. They should make a way to exchange or re-distribute, some of their current OWN properties, (based on the value on the time of their fathers death). Either the Mukesh (you was said to have acquired major part than the Anil) have to Legally balance the Gap by provinding Some of his own property either in Own Liquidity form (cash) or any Personal property / or any other Manufacturing Goods ( like Comodities). But this could be never happen. Since the Time has lapsed a lot, and they are not in a way to discuss, to balance. But GAS especially KG basin GAS is National Property, and it could not be Selled or Buyed on Private Grounds. Its totally Public. And the other way is Mukesh and Anil are playing a quite interesting drama inorder to gain control over the KG basin gas in an unfair way. If the agreement has to be followed or Implimented. Mukesh could buy the Gas as per the Cost given by the Indian Govnt, and then sell it to Anil group for the rate as indicated in the Agreement between them…for the Same Cost as indicated in the Agreement for the Time period (10 or 20 years). Then Mukesh will go Bankrupt, since The Indian Govnt cost for the Gas will not be stable, it will increase drastically year by year. So Mukesh will buy it at Higher cost and could end up selling it to Anil by 80% loss in average. During the agreement : Could be that they Devalued the Value of KG basin Gas / or could be that they planned a Game in-order to take a Chance if it works – to get the Natural Gas in Cheap rate, Under the name of agreement. Fortunatley the Govnt issued a Good Judgement (Hope it will continue the same all the time). Keeping the Brothers in Control. Nice to hear your unbiased views on the national assets / resources of the country. But, now with the verdict of the apex court, a clear precedent has been set regarding the safety of national assets vis-a-vis any kind of corporate or personal dispute by the contractors dealing with any of these resources. Focus usually helps in any business. Anil is trying too many things and no where he’s been able to deliver successfully. R-Com could have done well if they have optimized their customer service experience. They have lot to learn when it comes to understanding today’s customers. On the other hand, since Mukesh is in traditional business he can continue to expand it the traditional way- the way Dhirubai actually started! As you’ve correctly pointed out, the ADAG team is faulting somewhere in strategy or delivering over-all value to customers. Probably, its telecom division is doing well, but is stung by the intense competition. No doubt, there could also be some set-back it terms of customer service, and that could balloon into a big problem once MNP is implemented in the telecom sector. One aspect that is killing me is the way the stock of Reliance Capital has under-performed on the bourses, inspite of their financial business doing well. Surely, markets have read some unfavourable aspect and have assigned lower valuations to their business structure.